Magical Drop F was delisted from the US PlayStation Store the week of August 13th, 2012 alongside other MonkeyPaw Games releases: Kyuiin, Yakiniku Bugyou and Arcade Hits: Magical Drop. The reason is unclear but MonkeyPaw has stated numerous times on twitter that these games were “delisted by Sony and won’t be coming back” and that the delistings were “permanent” as far as they were concerned. “Magical Drop is a long-running arcade puzzle series in Japan, and a major influence on subsequent puzzle games such as Critter Crunch and Astro Pop. This was Data East’s entry into the versus puzzle genre, popularized by Nintendo’s Dr. Mario and Compile’s Puyo Puyo. 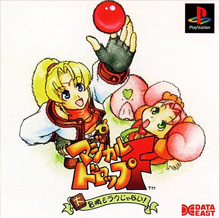 Magical Drop F was the first game in the series that wasn’t released in arcades, and the last game in the series before Data East went bankrupt. It was developed specifically for the PlayStation as Data East attempted to become a more console-oriented studio.